Sony has finally revealed that its new motion controller for PS3 is to be called PlayStation Move, and that it will have an additional nunchuk style add-on, similar to Nintendo's Wii. Sony's motion controlled wand-style controller finally got its official name at this week's GDC conference. PlayStation Move is set to be made available in three different bundles: standalone for those who already have the PS Eye; with the camera and a PS3; or with the camera and a game – which will cost under $100. Latency (or lag) for the Move is nearly non-existent at one frame, a similar response you get from the DualShock 3 controller. Sony demoed a one-on-one battle game called Gladiator Duel, and a table tennis game. The wireless nunchuk style add-on is to be called the 'Sub-controller', and was demoed with Sony's Socom 4. The Sub-controller features an analogue stick, so gamers can play more complex games like first-person shooters with PlayStation Move. "Sony Computer Entertainment (SCE) today announced that PlayStation Move motion controller for PlayStation 3 (PS3) computer entertainment system, launches worldwide this fall, offering a motion-based, high-definition gaming experience unlike anything on the market," said Sony. "Concurrently with its launch, SCE will also release PlayStation Move sub-controller to be used along with the motion controller for intuitive navigation of in-game characters and objects. "The PlayStation Move platform, including the motion controller, sub-controller, and PlayStation Eye camera, together with a strong lineup of software titles, will deliver an innovative and highly immersive experience on the PS3 system. "The combination of the PS3 system and PlayStation Eye camera detects the precise movement, angle, and absolute position in 3D space of PlayStation Move motion controller, allowing users to intuitively play the game as if they themselves are within the game. 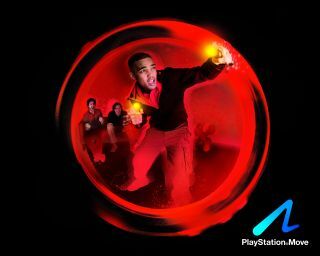 "PlayStation Move motion controller delivers unmatched accuracy through its advanced motion sensors, including a three-axis gyroscope, a three-axis accelerometer, and a terrestrial magnetic field sensor, as well as a color-changing sphere that is tracked by PlayStation Eye camera. "Through PlayStation Move system, both fast and subtle motion can be detected, whether the user is swinging a tennis racket, or painting with a brush. "With PlayStation Move motion controller, users can provide direct input through action buttons and an analog trigger, while receiving physical feedback from rumble functionality and visual feedback from the sphere's ability to display a variety of different colors. "Furthermore, PlayStation Eye camera can capture the player's voice or image, enabling augmented reality experiences." "The newly announced PlayStation Move sub-controller is a one-handed controller, developed to further expand the game play options that PlayStation Move games can offer," Sony added. "PlayStation Move sub-controller features a sleek curved design that pairs with the motion controller and comes with an analog stick and directional buttons that allow users to easily control the game when moving characters or choosing a direction. "Like all other Wireless Controllers for the PS3 system, it comes with a built in lithium-ion rechargeable battery as well as Bluetooth® technology, enabling the controller to transfer the input information wirelessly to the PS3 system without a cable. "PlayStation Move motion controller and sub-controller will further broaden the gaming experience on the PS3 system for all genres, from games that use one motion controller to games that use both controllers. "The introduction of PlayStation Move controllers has been well received within the industry and now 36 third party developers and publishers have decided to support PlayStation Move platform. "In fiscal year 2010, SCE Worldwide Studios will also release more than 20 games that are either dedicated to or supported with the PlayStation Move platform. "SCE, with strong support from software developers and publishers, will deploy various measures to enhance the PlayStation Move software title line-up and vigorously promote the PS3 platform."